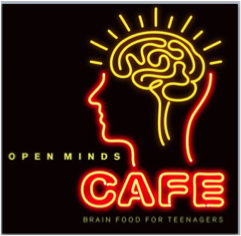 Vicki DiMuzio, from Whiteville, NC shares a bit about their Open Minds Teen Science Café and her experiences with getting it up and running. Vicki is the Education Coordinator at the North Carolina Museum of Natural Sciences at Whiteville. From what I can tell, she really enjoys her job! To start off, tell us in a nutshell about your Teen Café program . . . what’s special or unique about it? This is most easily answered by pointing you to two videos created by a local news reporter in December 2014. She interviewed me and some of the teen participants/leaders. Take a look at these! 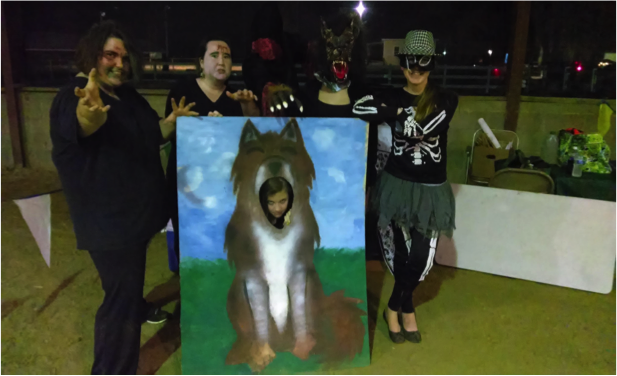 Zombies, werewolves, and skeletons . . . oh my! In addition to engaging teen leaders in organizing our café events, I also encourage and help our teen leaders volunteer in other community activities. They have volunteered at the Museum of Forestry during special events, at Lake Waccamaw’s Halloween Safe Night Carnival/Haunted House, at the Museum’s booth at our County Fair, and at the Pay-it-Forward Volunteer Fair. They do this while wearing their Teen Science Café shirts, thus marketing our Teen Science Café and the Museum. I was hired at the Museum 2 1/2 years ago as an Educator. This was the same time that the Museum was included as part of the National Science Foundation’s grant to start a Teen Science Café. Having the background as a Middle School Science teacher, I was asked to take on the TSC project. Prior to working at the museum, I had been involved with Science Olympiad, Bridge Building, Science Fair, Science Lab, and AIG pullout teaching during my stint in the public school system. 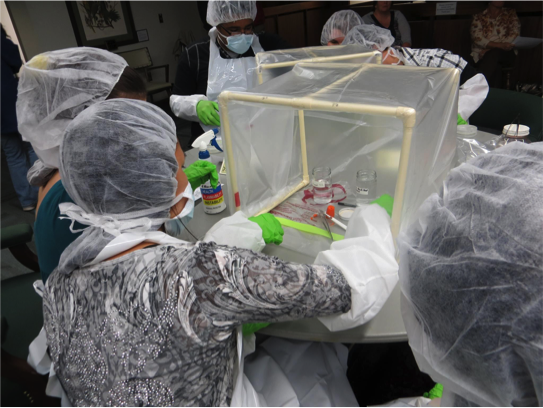 I was also part of the Teacher’s Advisory Board at our Museum, so taking on the TSC project was a natural fit! Your program has a home with the North Carolina Museum of Natural Sciences . . . how do you see the Café program fitting with their mission? The Museum of Forestry is an extension of the North Carolina Museum of Natural Sciences in RaleighSciences in Raleigh. We reach out to the more rural communities in the southeastern part of North Carolina, providing a taste of the best interactive exhibits and programs that the Raleigh museum has to offer. Many of our patrons don’t want to or can’t travel to Raleigh. We have the same mission statement as the Museum in Raleigh, and therefore are a very integral part of meeting those goals. We do this very effectively, I might add, since we reach a population that might otherwise never have the opportunity to visit the Raleigh facility. In regard to the Teen Science Café program, we offer a more personal experience to participants due to our smaller size, but with comparable speakers and topics. 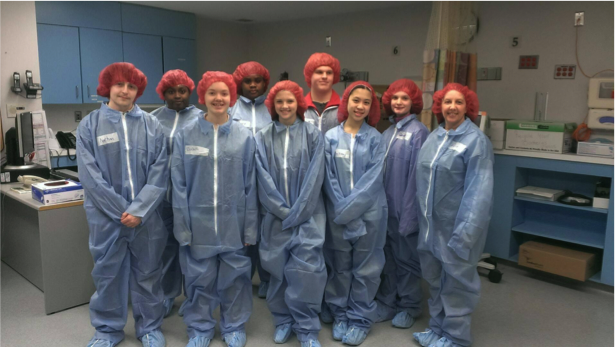 Our numbers allow us to do things larger groups may not be able to do, such as an intimate ‘behind the scenes’ tour of a local hospital. The greatest difficulty has been getting teens involved. As I am sure you all know, the youth of today are involved in so many extracurricular activities. In our community, those are primarily sports and dance; so a science café isn’t even considered by most. Fortunately for me, my youngest daughter was in middle school at the inception of our TSC. She has a core group of friends that are academically motivated and thus embraced the TSC openly, becoming my first Teen Leaders. Besides being an involved parent, having been a teacher in our public school system gave me a network to at least begin recruiting. Another benefit was our early college program (at the local Community College) where the students are required to get volunteer hours each week. All of this was helpful, but not enough. What to do? What to do? General marketing and personal contact with teachers/parents has been a key. Our museum has reached out to the surrounding school districts and made contact with their central ‘marketing’ person whom we send our information to so they then pass the info on in a group email to their entire systems. We have recently beefed up our email list and contacts with surrounding area newspapers both printed and digital, and other educational facilities that we now reach out to. Social media, of course, also plays a main role in ‘getting the word out’. Planting the seed that teachers might want to offer extra credit to students who attend the Cafes has brought in teens. Teachers who participate in this concept email me prior to the Cafe and I send them a list of students who attend, which makes the process easy for the teacher. I also use a TSC email list comprised of teens who have attended and offered their emails, science teachers, community leaders, parents…I also try to speak with parents when they bring their teens to the Cafe. Another strategy that has made an impact is that all correspondence from TSC have our TSC logo on it which is becoming a recognized symbol for our program. 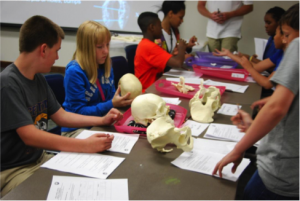 Our TSC program has grown each year, and with the recent repurposing of our museum from Forestry to Natural Sciences, we are making leaps and bounds in not only raising awareness of our Museum as a whole, but for our Teen Science Café which has become a very integral part of what we have to offer as the North Carolina Museum of Natural Sciences at Whiteville. This is a hard question because several pop into my head. Since I must choose one, I would say our November 2013 Cafe entitled ‘Trapped in Science’. Becky Westbrooks, from our very own Southeastern Community College spoke about her work/research on the micropropagation of Venus flytraps in an effort to keep them from becoming extinct. This was a relevant topic given that the only place Venus flytraps grow in the wild abundantly is right here in Whiteville’s backyard. Poachers, who harvest the wild Venus flytraps illegally (to sell), have just about wiped the population out. You are welcome to read more about her work, but in short, Ms. Westbrooks has found a way to micro propagate, or abundantly reproduce/grow genetically comparable Venus flytraps. Learning about her research and the process she goes through was truly eye opening. The best part, however, was the hands-on activity. 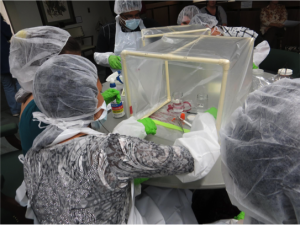 Each teen in attendance got to go through the process of micro propagating a carrot with full on sterile gear and a makeshift sterile environment. They were indeed scientists for the evening! In addition to adopting one of Ms. Westbrooks micro propagated Venus fly traps, each participant left the experience with a petri dish holding their micro propagated carrot. They were asked to report back to me what happened within their petri dish the following week. 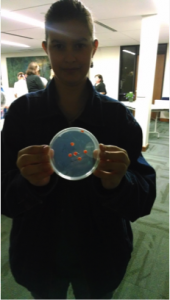 Needless to say, we all learned the importance of maintaining a sterile environment during experimentation as mold grew in abundance in all petri dishes of the teens I spoke with the subsequent week. Working with the teens and watching them ‘blossom’ is by far the most rewarding aspect of coordinating the Teen Science Cafe. Part of our TSC leadership program is learning more about proper ‘etiquette’/how to present themselves to make an impression. Case in point: Do not present yourself chewing gum and use the greeting “Hey, what’s up?” with a wave at an interview, while representing your leadership position in Teen Science Café, or in anything that would be considered an ‘adult situation’. They take my suggestions to heart and become more confident in themselves through seeing the reaction of others to their ‘transformation’. Teen leaders also take turns greeting and introducing our speakers, which is an opportunity to polish public speaking skills. 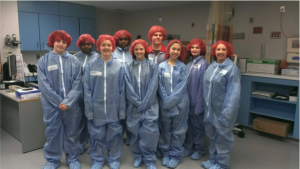 The teen leaders help coordinate and run the Cafes and assist with marketing efforts; all experiences that can make a resume for college and/or work look more impressive. Watching them light up and become animated when we are doing activities such as brainstorming new topics, phone conferencing, or Skyping with our speaker prior to each Café warms my heart. In general, seeing all participants in the Cafe engaged, asking questions, and having discussions with one another following the Cafe presentations tells me what we are doing is sparking interest in Science and STEAM which is making a difference!!! Thank you, Vicki, for taking the time to chat with me and sharing your great ideas with the Network! !